Because Lidar has become more affordable and scanners produce measure points much faster and much more accurately humans ever could, it has become the standard measuring tool to start building modeling. But, this technique still requires human interaction to create high-fidelity models. Find out why. The term “Scan-to-BIM” is often found. This is misleading because it suggests that a BIM model can be created automatically from a point cloud. Unfortunately, this is not possible with current technologies, except with very simple models, eg. models that consist only of slabs and walls. For most practical situations, full automatic processing is not yet realized and academic researchers are still investigating how to get closer to the holy grail that is a fully automatic scan-to-BIM solution. Fig 1. 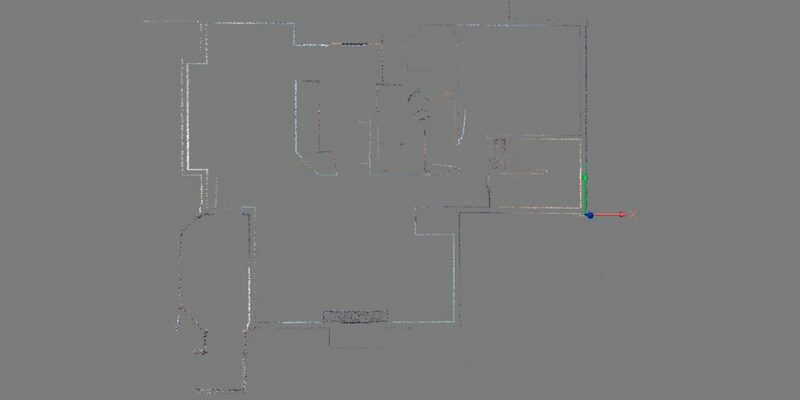 Even for a human, it can be difficult to decipher elements within a point cloud. One of the big remaining challenges is that point clouds are often an incomplete representation of a scene. Trained human experts can deal with this incompleteness. However, methods of translating this human expertise to an AI solution are still under investigation. For now, building a CAD or BIM model from these points still requires human interaction. In order to distinguish between interesting features and ‘clutter’, it is important to be able to focus on small sections of a point cloud at any given moment. Even for experienced operators, when the whole scene is visible, it is nearly impossible to recognize objects within a dense point cloud. 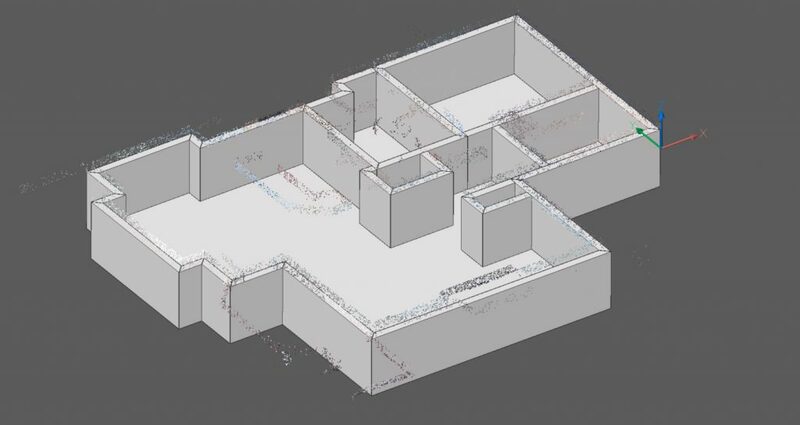 The key to being able to work effectively with large point clouds is to process and model small parts at a time, and then move the focus to another part of the point cloud. Use BricsCAD’s POINTCLOUDCROP command to do this. 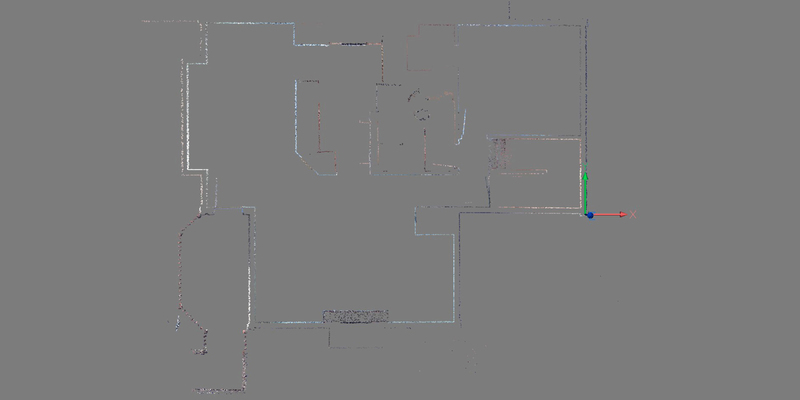 Typically, point clouds are split into slices, parallel to the floor plane, at different heights. These can quickly give an approximation of the floor plan of a building. Fig 2. Cropping the point cloud into manageable slices makes it easier to work with the data. It is much easier to make out the layout of rooms and walls. In fig 2, the house point cloud shown in fig 1, has been sliced. From this slice, we already get a pretty good idea of the floor plan of this building. Use this slice as a visual guide and snap to the points when modeling in BricsCAD for a higher accuracy. Fig 3. Quickdraw has been used to quickly draft an approximation of the layout. By using a tool such as Quickdraw, it is now very easy to create the layout quickly, with BIM data! In a minimal amount of time, you can go from point cloud to BIM. Fig 4. With just a little more work, you can have a full-scale model in no time.